Monklets are snippets of code used to dynamically include content from your site. 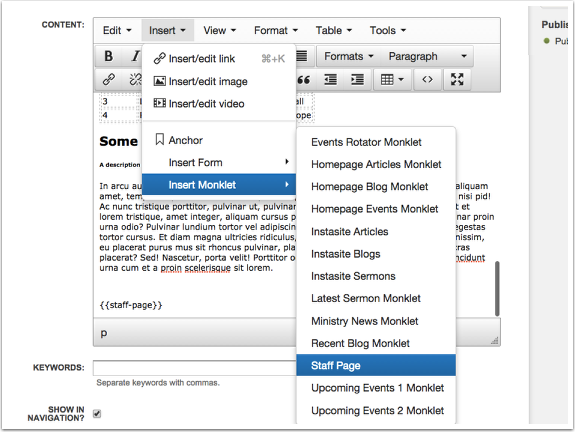 For example, a Monklet can be used to include the latest blog post, the three latest articles, or a signup form from the Forms module. To insert a Monklet into your content, click Insert > Insert Monklet and select the Monklet you want from the pop-up menu. There are several common section Monklets available for you to use in the sidebar. Recent Blog Monklet : Displays the most recent three blog post from all blogs. There are three default sections using monklets on your Wilberforce homepage. Homepage Articles Monklet : Displays the most recent article. This monklet will use the image attached to the article and display the image with 400px by 225px dimensions. A short preview of the article will be displayed but limited to 100 characters. Homepage Blog Monklet : Displays the most recent blog that has been published as featured. This monklet will use the image attached to the blog and display the image with 400px by 225px dimensions. A short preview of the blog will be displayed but limited to 100 characters. Homepage Events Monklet : Displays the next upcoming event. This monklet will use the image attached to the event and display the image with 400px by 225px dimensions. A short preview of the event will be displayed but limited to 100 characters. Mk021 comes with a staff monklet that can be used to easily create and manage a staff page. Go to the staff monklet article in the setup guide for further instruction.